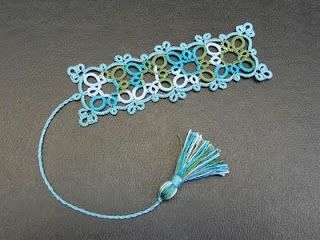 I was contacted by a lady from a lace group interested in a bookmark I made for an exchange at In Tatters last year. I had adapted the Quatrain pattern into a bookmark. 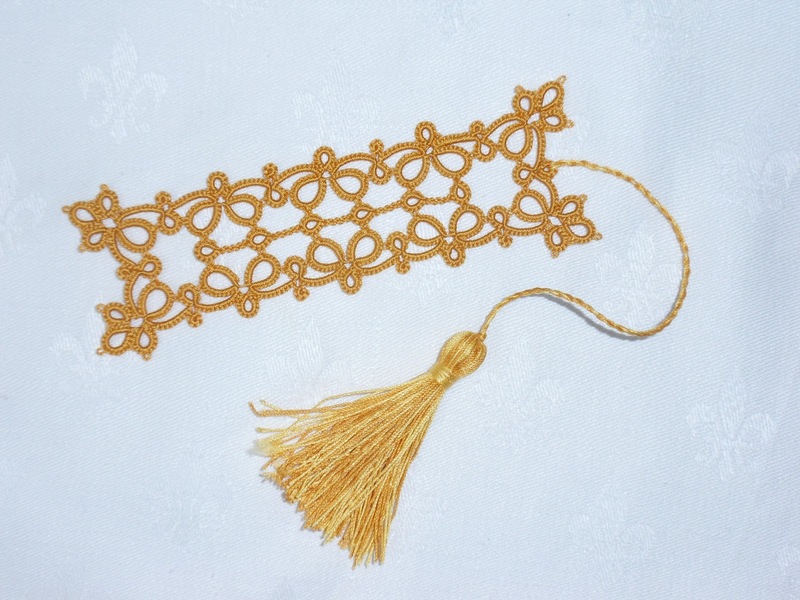 This involved repeating the centre motif and then making a border. This means cutting, tying, hiding ends... I don't like those jobs! So it started me thinking about the design and how I could keep the idea of Quatrain but adapt it so that the bookmark could be completed in one pass. After some trial and error, here is what I've come up with so far. I even tried Jane Eborall's method of throwing a ring off a ring (thank you Jane, you are wonderful!) to get the small rings in the centre of the design but I felt that was quite an advanced technique which some people would not want to tackle. I will probably re-visit it though because I liked the look of it. but as I said, it does mean making each element separately. Well, actually you could do two and two, using split rings. 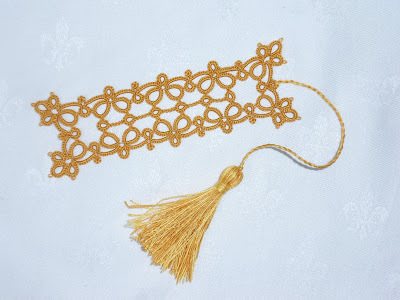 I may also re-do the top bookmark but adding picots in the centre elements to fill the spaces a bit. I'll also see if I can get a better hang of the thrown rings off rings (TROR? TRR?) because they would be very useful in some circumstances - including here! I love the original but the new one is exciting too! I love the original, and I'll be interested in what you do to re-think the whole process, but I'm not sure I'll have the skills to try your new ideas. Cut, tie, and hide the ends works for me! I have to say I LOVE the last one! I probably would opt for cutting and tying,but it's brilliant how you worked it out with the more sophisticated methods. I've admired this motif since I first saw it, and I've wanted to tat it. It's great seeing it expanded into this beautiful bookmark! Now that I have read your post more slowly. I realize the blue/white one is the 'original' (although it's the last photo), and it IS the one I meant in my previous comment. And the white one seems to be the same as the blue/white, except it has picots in the center rings, which I also find attractive. 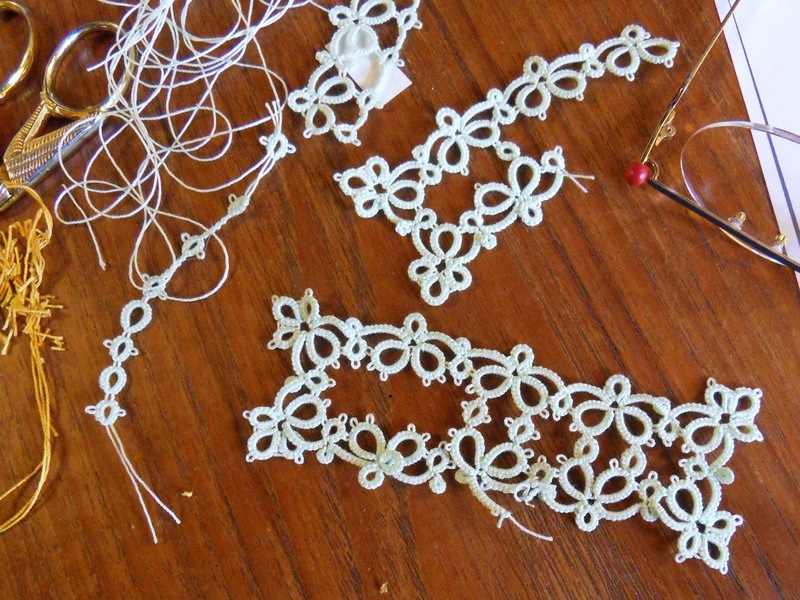 So, as I understand it now, the blue/white and the white still involve cutting and tying (which is fine with me! ), and the gold is made in one pass with the thrown-off rings! I think I have it straight now! And although I admire your persistence in wanting to do it in one pass, the blue/white and the white imitate the original motif beautifully. Yes the last one is the original, the one in the middle is done in one pass but using rings thrown off rings, and the gold one is made also in one pass but using a line of split rings in the middle. Thanks for the reply! Wow! For me, the third time is a charm! 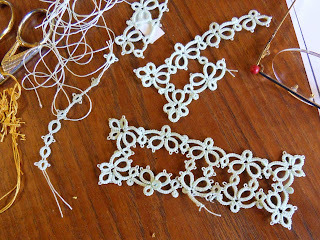 So the white one has the thrown-off rings, and can also be done in one pass, like the gold with the line of split rings. I'm amazed it's even possible to do that on the white one. I love seeing your work table, which is a glimpse of the hard work and thought processes that go into these designs. They are both very beautiful! Gorgeous blue color as well! Thank your for the comments! I'm still working on this one and should have more versions to show you soon.